So you have the basics — some bandages, gauze, tape, scissors, and a thermometer — but what are some natural remedies you can include in your natural first aid kit or medicine cabinet? What can you use to replace chemical-laden over-the-counter medicines and ointments from the drugstore? 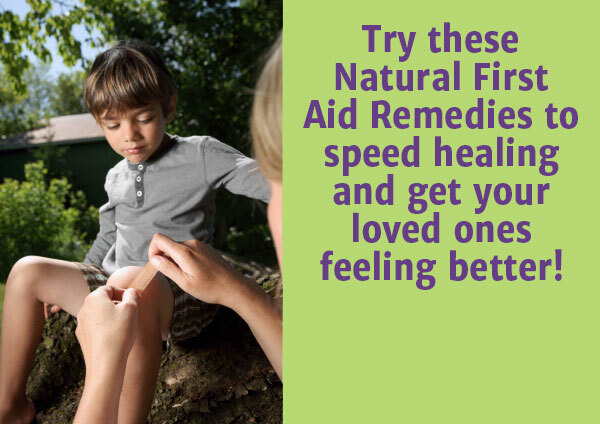 Below we have some of the best natural, herbal, and homeopathic remedies to help you build a natural first aid kit to be prepared for common injuries and ailments. Keep a small kit of essentials in your car, bag, or backpack to naturally treat minor injuries on the go. At home, consider creating a “healing basket” full of your favorite natural remedies, herbs, salves, teas, tinctures, and hot/cold packs or hot water bottles, so you’ll have everything on hand when anyone in your family becomes ill or injured. Sovereign Silver is the top-selling colloidal silver nationwide. Silver is a natural antibiotic, making this homeopathic First Aid Gel the perfect substitute for OTC antibiotic ointment, burn cream, and calamine lotion in your natural first aid kit. Use it on cuts, scrapes, burns (including sunburns), bruises, rashes, acne, and bug bites and stings, to prevent infection, soothe pain, and reduce swelling, redness, and inflammation. While you’re at it, grab a bottle of Sovereign Silver Fine Mist Spray, too, and keep it in your natural first aid kit for internal use in treating bacterial, viral, and parasitic infections. Petroleum-based vapor rub does not belong in a natural first aid kit. Toss the vapor rub and replace it with this all-natural Calm Balm from Green Pasture. Rub it into the chest to ease stuffiness and chest colds, or use it on sore muscles and joints for relief of aches and pains. Blue Ice Calm Balm is made from nutrient-rich oils (high vitamin butter oil, coconut oil, fermented cod liver oil) and menthol, camphor, and eucalyptus oils. Plus, you’ll get a dose of vitamins A, D, and K right through your skin! Bentonite Clay is an excellent product to have on hand in your natural first aid kit because it can treat a variety of ailments. If you’re suffering from nausea, vomiting, diarrhea, or food poisoning, take some bentonite clay to speed recovery. Bentonite clay is able to bind to or absorb toxins and bacteria so that your body can eliminate them quickly. Bentonite clay can also be used for heartburn, acid reflux, bloating, and indigestion, as it has an alkalizing effect, reducing acidity in the body. Use bentonite clay externally on burns, cuts, stings, and bites (including bites from bugs, spiders, and snakes) to help draw out toxins. This is also a soothing, natural anti-itch relief for those with rashes, chicken pox, poison ivy, or skin conditions like psoriasis, eczema, and acne. Magnesium is a gentle, natural laxative, and Natural Calm will fit neatly into your natural first aid kit. Natural Calm magnesium is better absorbed than milk of magnesia, and much safer than OTC habit-forming laxatives. No one enjoys being all stopped up, so this is definitely one you’ll want to add to your natural first aid kit! Start with a small dose and work your way up until things are moving along well again. As a bonus, magnesium can also reduce stress, tension, and anxiety, helping you relax and sleep better, and it can ease muscle pain and stiffness. Honey in your natural first aid kit? Yes! Wedderspoon Manuka Honey Active 16+ is a highly bioactive manuka honey with antibacterial, antiviral, and antifungal properties. Manuka honey has even been found to kill antibiotic-resistant bacterial superbug strains like MRSA. Use it either internally or externally to eliminate infections naturally. Take a spoonful up to three times a day for digestive issues and infections. Externally, you can apply a layer of manuka honey to wounds or skin infections or rashes to speed healing, prevent infection, and reduce scarring. You may also want to add a bottle of Walkabout Emu Oil to your natural first aid kit. Walkabout Emu Oil is available in a topical formula, perfect for rubbing into sore muscles and joints. Whether you have a recent injury, shin splints, or growing pains, this oil (which, yes, is indeed from emus!) reduces inflammation and soreness. What’s more, emu oil can also be used for sore gums, bruises, cuts and scrapes, burns, and bites, as it is also antibacterial, reducing pain, swelling, and scarring.